President Muhammadu Buhari said Thursday in Nairobi that for peace to reign in the world, the global community must develop and implement comprehensive and coordinated counter-extremism strategies at sub-regional, regional and continental levels. Speaking at the opening of bilateral talks between Nigeria and Kenya, President Buhari warned that radicalization and violent extremism were increasingly taking root across Africa and must be tackled head-on and with brand new strategies. “The threat posed to national, regional and global peace and security by terrorists has taken an alarming dimension in recent times. “In Nigeria, Boko Haram has caused havoc, especially in the North-eastern part of the country – killing, maiming, destroying livelihoods and displacing hapless citizens, majority of who are women and children. “In Kenya, you also face terrorist challenges. Similarly, Iraq and Syria, are facing their own brand of terrorism which has thrown the entire Middle East into turmoil. Terrorism does not respect religion, creed, race or national boundaries. No country is safe from the menace. “This is why the entire global community must work in a concerted manner, particularly in areas of sharing intelligence and pooling resources and finance to confront the scourge. Our armed forces and security services should also be adequately supported and well-motivated to fight terrorism. “It is worth emphasizing that terrorists are continually changing tactics, building alliances, merging and generally getting more sophisticated, all in an attempt to build their capacity to inflict pain and misery on societies. “To win the war on terror therefore, we must respond to this phenomenon by developing new and versatile strategies. Together with our allies, Nigeria and Kenya can successfully tackle these challenges that have traumatized and brought untold suffering to our people. “The need to tackle and defeat terrorism cannot be overemphasized as there can be no development and prosperity in an atmosphere of insecurity and instability. “Our communities must be helped to build resilience against violent extremism. The extremist narrative and ideology by radical elements and militants in our societies must be tackled through a counter-narrative that emphasizes education, moderation and tolerance. “For our efforts to achieve desired results, communities, religious leaders, civil society and educational institutions must be fully involved,” President Buhari said. 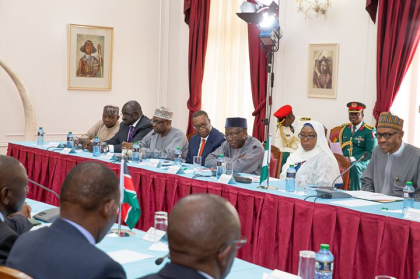 Later, at the Nigeria–Kenya Business Forum, President Buhari expressed confidence that the Nigeria-Kenya Business Council and the Kenya-Nigeria Agribusiness Forum will serve as platforms for the promotion of intra African trade. President Uhuru Kenyatta thanked President Buhari for honouring Kenya with the visit.